The Athabasca Waterfall lies on the Icefield Parkway. It is just there, shortly after you join the Parkway from Jasper. The water falls down a canyon and flows into a lake. The colour is turbid blue from the rock flour that the waterfall has ground down along its course. The canyon is itself surrounded by pillowy moss, lichen, saxifrage and stunted willow. Travelling this road, in the reverse direction from two days ago, and in a different climate, the Rockies were totally different. There was something about the cloud formation, something about the slant of the sunlight, the slight chill in the air and the fact we were listening to jazz, that changed the experience. 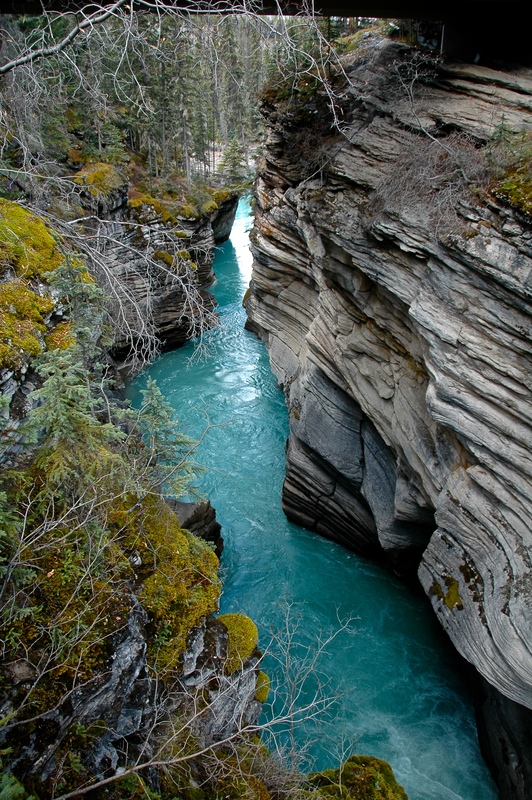 If you can imagine Eroll Garner’s quicksilver playing, the run of notes that is like a cascade, indeed a waterfall, when he plays Misty, then you can glimpse how Athabasca waterfall looks in the light, glistening and rushing, the sound of water on rocks. The river swirls, giddy after its fall, and just as you turn to see the faint spray in the air, Errol Garner does that surprising four-beat stop that is like a lump in the throat. 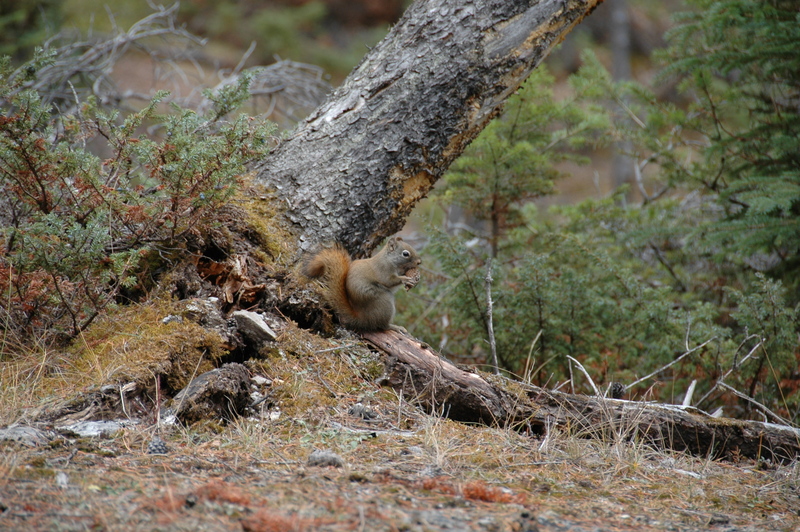 There was a surfeit of Lodgepole pine, Douglas fir and poplar on our way. It was easy to mistake the poplar for silver birch, and there was even more of silver birch. But, silver birch is actually silver and it lights up especially when there is an absence of sunlight. Both the poplar and birch were now devoid of their leaves. In a sea of evergreens they stood out. But they also stood out because of their standing to attention, row upon row of them, like an army that is stock still and erect, wary of the enemy. There were sentinel trees too in the middle of a tribe of pine, possibly aspen but maybe poplar with their yellow, very mustard leaves, still clinging on. Jan said that they are like lit lampposts or lanterns in a greenfield. 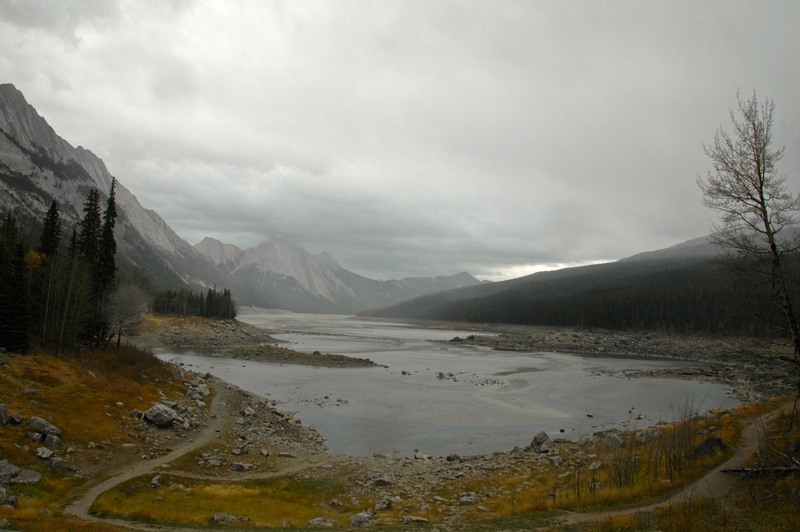 The Athabasca river flows alongside the road. It glistens and flashes through the fir screen. The rippling, subtly creased surface shines somewhere between molten silver, tarnished silver, mercury and jade. Surely, this is merely a trick of light and the eye. On the other side of the road, low lying clouds wrapped around the peak of Cirrhus looked like white turbans with tasseled edges. Exactly like Dinah Washington’s breath as she sings, lilting and lifting. She was extra sensual in her life and there is in her singing, in the breathy sound, that promise of shut eyes, only half shut, mouth delicately just open, and a gasp that is at once delirious and expectant. Tangle ridge is cloistered in clouds and the sun is working doubly hard to streak through, weak rays give the clouds an air of a windscreen that is smeared with dirty raindrops. But then across the road another range smothered in clouds has the sun shining bright, through a breach and there is even brighter reflected light, as If a giant flood light was placed at the base of the mountain range, in a large basin of water and shone upwards. Absolutely glorious. Not on our return journey, but the other day, the road was lined by yellow mountain avens with their white cotton buds, miniature candy floss along the very edge. And upwards from the road’s edge the Athabasca glacier was a frozen static river with dirty sludge at its terminal point. It was very strange to see a river that was immobilised. It was like a magician’s trick holding the river still, by a spell known only to the initiated. The Icefield Parkway was not a road at all but a time series of memory linked by space and music. Crowfoot glacier and Miles Davis playing Spanish guitar on trumpet. Peyto lake and Madeleine Peyroux discovered busking in a Paris metro station. That’s exactly how surprising Peyto lake is when you suddenly come upon it. The journey between Banff and Jasper was through the most exquisite landscape ever. 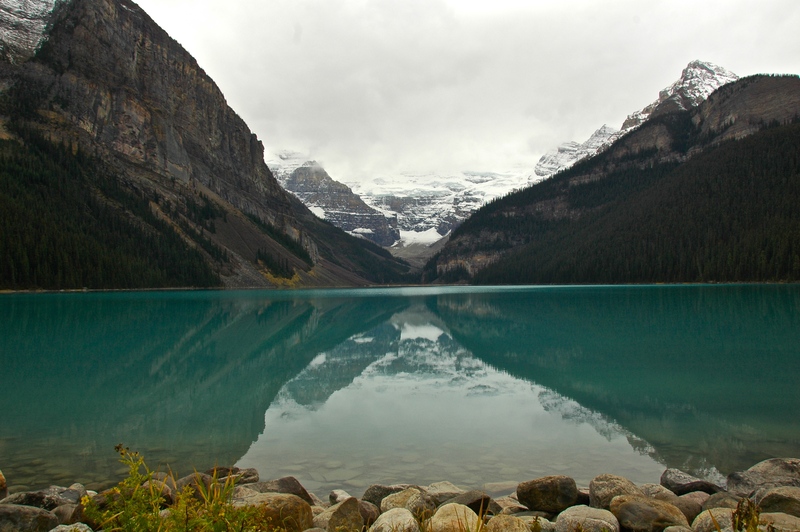 We took a detour through Highway 1a, and travelled through Sawback, Moose Meadows, Castle Mountain, Storm Mountain, Protection Mountain, Morant’s curve, and arrived at Lake Louise. It was a leisurely drive with mountain upon mountain on either side of us. Every bend of the road brought another unexpected vista. It was the scale of the landscape, the far horizon and the large sky that characterised the scene. This is exactly how it is in Africa, on the East African plains of the Serengeti, where one feels excruciatingly small and expendable. The message is – all this has been here forever and we forlorn humans have barely been here in the blink of an eye and will soon be gone too. 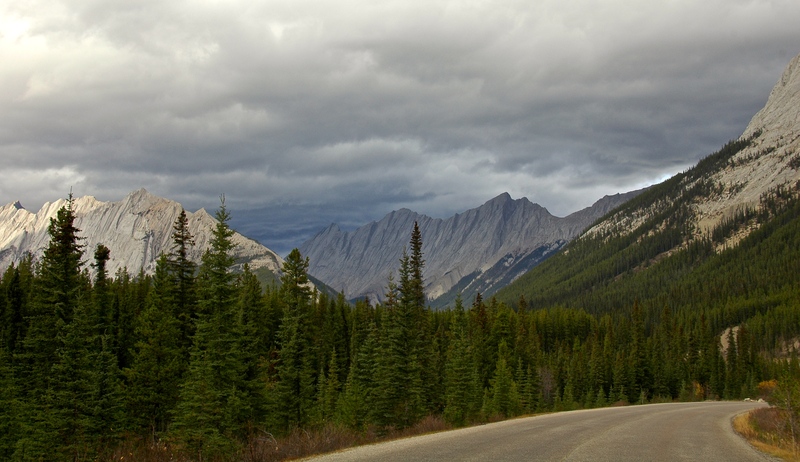 The drive on the Icefield Parkway towards Jasper was different all together. We climbed and climbed, the road weaving and turning like a river that meanders, all the time climbing higher still. The clouds were heavy and we imagined that it would snow any time now, except that the air temperature was too warm. The lowest it got throughout our passage was 9 degrees. Sometimes we were driving at such an altitude that the road was at the same level as the tops of the pine; that was a sight to see. The mountaintops were packed with snow and ice. 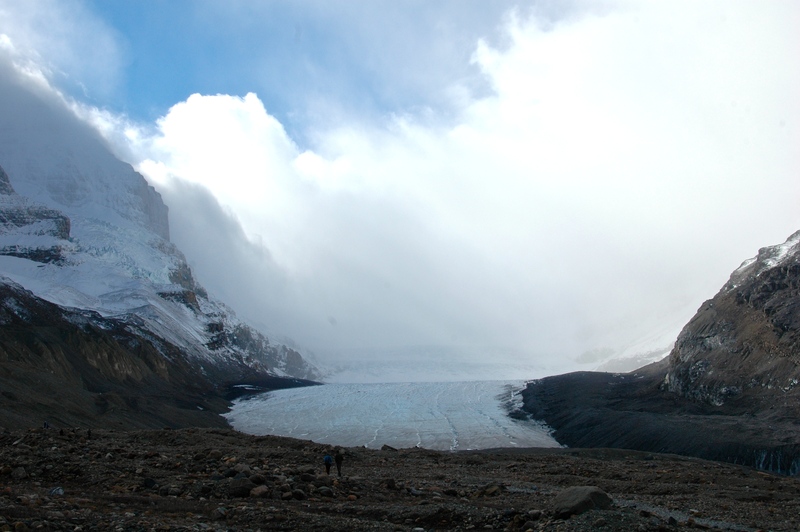 Then past Mosquito creek, Bow Peak to our left we came upon Crowfoot Glacier. In the evening light we caught glimpse of that frozen tongue of blue, pale blue, that was the glacier. But the real spectacle was still to come, Bow Glacier Basin and the Columbian Icefield, a broad street of ice, no a boulevard with its terminal moraine in the full glare of eyesight in the dying light. In Jasper we stayed at Sawridge Inn. This was at the far end of Connaught Avenue. Jasper is really a one street town and Connaught Avenue is the street. 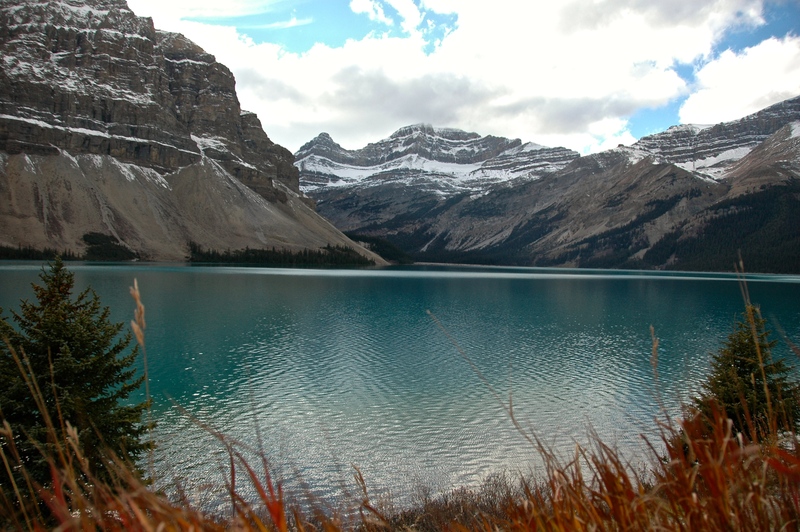 To get to Sawridge, we drove out towards Maligne Lake. Our first night at Sawridge, we had dinner in. The meals were terrible. Jan had stuffed aubergine, exactly! Stuffed with a mess of yellow, green and indefinite pottage. I had ice cod, whatever that is, on a bed of new potatoes and some purple slush! Never again! The woman sitting next to us struggled through a pizza, even that was not what you would expect. The cheese board, however, was a winner. The waiter, our waiter was a young white man, too tall for his movements, so that he seemed awkward and sadly uncoordinated. He dropped everything that he tried to carry. He was so laid back that he might have been Mr Desultory. And his assistant, a young Canadian woman, dark haired, slim, was equally slow and unhurried in her approach. The next morning we went out for breakfast to The Other Paw, recommended by Oprah Winfrey, no less! I had a most unFrench croissant and jam. Jan had some bun or the other and large cups of cappuccino to wake us up. Then we went out to see the train engine on display, built in 1921 and decommissioned in 1972. Next, was the Jasper Totem Pole by the train station. Until recently it was a Black Raven totem pole but was replaced in 1992 by the Two Brothers totem pole. Jasper used to be a meeting place, a crossroad between Native Canadian fur dealers and European traders. It is a most magnificent centre point. The mountains range round it. 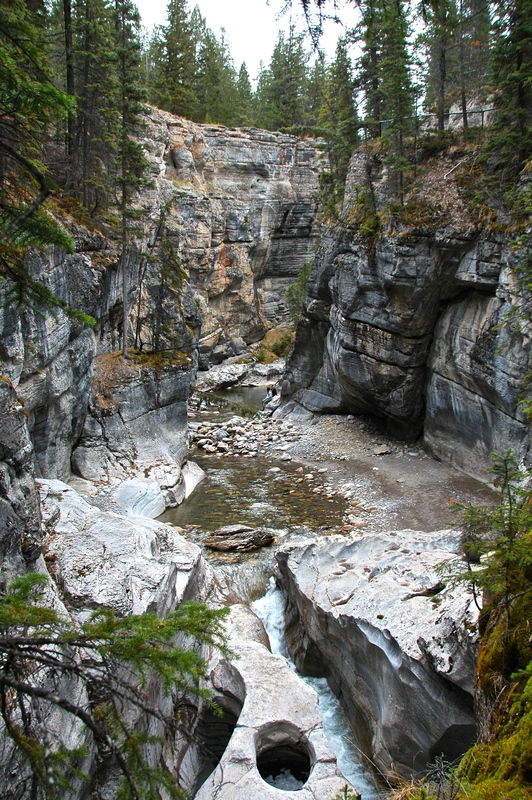 Then the river, Maligne canyon, cut 51 metres into the Rock, Medicine lake, and Maligne ranges and lake. The pine and spruce dense and denser still, up and up, towards the summits of the mountains. The mountains too, sandstone, limestone, perhaps granite too, were majestic and spectacular, lofty in the mid morning sun. The tips just in the clouds and the sprinkling of snow like talcum powder to adorn, to make more beautiful, what was already glorious. 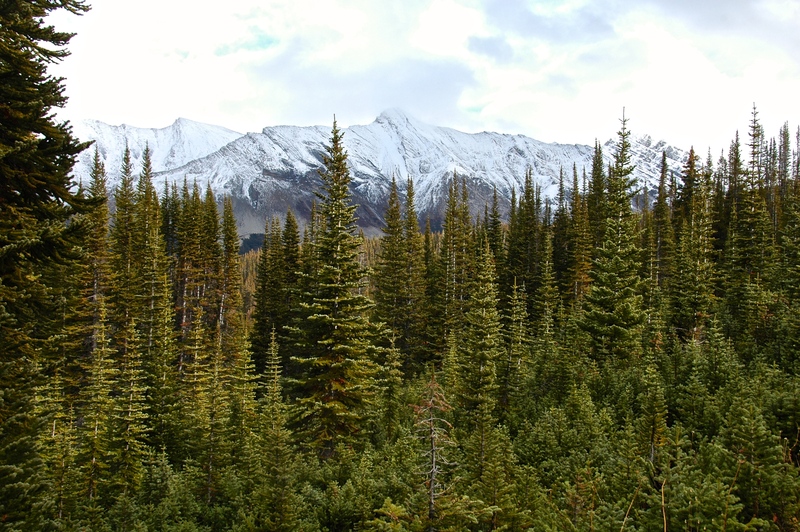 Some of the mountain ranges along the Icefield Parkway have pine, dark green, growing in the v-shaped joints between two mountains, like unruly pubic hair. And there were armpits too, festooned with spruce and fir. Occasionally, a spring dribbles and flashes in the sunlight, like an elderly man with poor control of his waterworks. It was impossible not to drink in the scenes, literally, it was all so picturesque that one’s mouth was wide open with “wow” and “wow” that at the end one was so drunk that one [I] swayed and staggered! That’s how rich and intoxicating this trip had been.